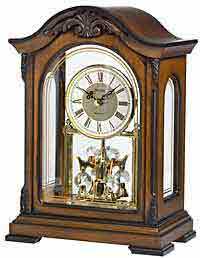 Traditional look of a tambour style mantel clock, The Rhythm Joyful Remington is set off by the two raised accent panels on the face to enhance the beauty of this model. Beaded molding on the base with an antiqued dial and antique brass bezel. Our signature musical movement offers 6 Christian Hymns / 16 Popular Melodies / 6 Christmas melodies. Adjust the volume or you may turn off the sound completely or use the automatic night-time shutoff which will turn off the music after 10:00 and come back on after 6:00 AM.. Runs on 2 C Batteries (Included). The Joyful Remington plays one of 28 melodies every hour on the hour from 3 different melody groups (no chimes). Just flip a switch on the side to change your group selection. Size: Height 11.1" Width 18" , Depth 5 1/16". Clocks for sale at The Clock Depot including the CRH204UR06 at discount prices.